Don’t know where your money’s disappearing to? We’ll give you a solution, without having to hire a full-time accountant. Track all your income and expenses, so you know where your money’s going. Prepare cash-flow reports to monitor—and improve—the financial health of your business. Create professional quotes and invoices that impress customers and clients. Quickbooks is simple to use. With just a bit of training with the software, you’ll get the hang of it and improve your ability to keep track of your money. Best of all, most good accountants use Quickbooks (we do). If you keep all your financial details in Quickbooks, sending them to your accountant at tax time is a breeze. They’ll be in the proper format for your accountant to go over, saving them time—and saving you money in accountant’s fees. 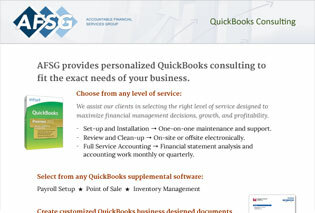 We’ll come out to your business and set up Quickbooks for you. We’ll also give you training on how to use it. Rather than spend time wrestling with a new software program, you’ll be able to start making it work for your business right away. To learn more about this service, contact us by clicking on the button below.